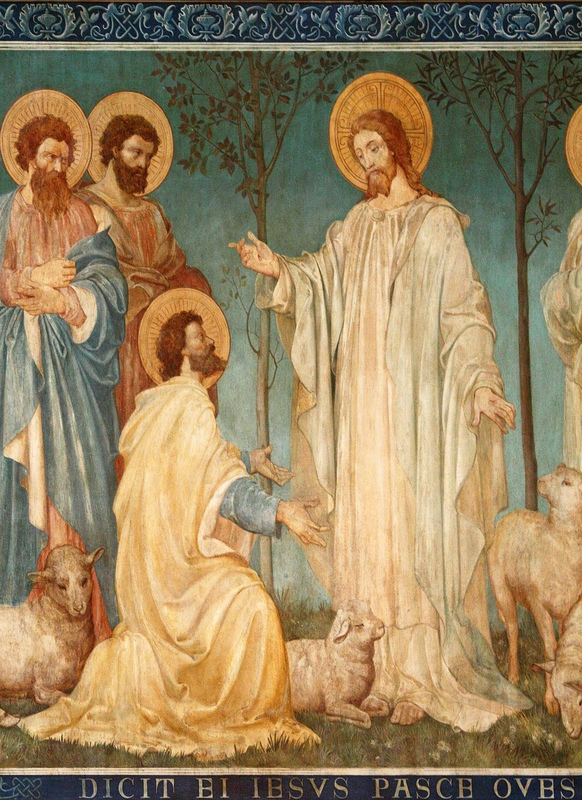 Why I’m Still Catholic: Lord, you know all things; you know that I love you. There’s a challenge going around for Catholic bloggers to come up with their reasons for being Catholic in light of the Pew poll about more and more people leaving religion. It reminds me of a homily our priest gave last year where he urged us to come up with our “elevator speech”. If you were riding in an elevator with your boss what would you say in that brief time to impress him? If someone asked you why you were Catholic in an elevator what would be your most concise answer? It boggles my mind. I can’t imagine a short answer to that. Because being Catholic to me is everything. And I mean everything in every sense of the word everything. I can trace every good thing in my life back to my faith. Catholicism has given me what I prize of my childhood and the family I grew up in. Catholicism has given me the personal principles by which I live. Catholicism gave me my intellectual interests and my educational and vocational choices. Catholicism absolutely brought me to my husband, forged the love that impelled us to marry, and has kept that marriage vibrant and strong for the last 9 years. Catholicism has given me all my children. No seriously, I would NEVER have been brave enough to take on all these kids, or have a baby right after getting married, if I had been raised to believe that marriage, big families, or early motherhood were stifling or unworthy. No way. And I am so so grateful that I thought otherwise. I cannot imagine for a moment life without each one of them. Catholicism has made my life what it is and I love what it is; so I couldn’t ever give up the source of all that. At the same time that that is true, my entire life has been punctuated by periods of extreme doubt. I jokingly say that I’m either a Catholic or an atheist. For myriad reasons I’m certain that if there is a God he is the God I know. Yet as far back as I can remember I have been plagued with the fear that there is no God at all. One of my very earliest memories, one of those flickering disconnected images, is of one of these times of doubt. I am in my first home, which we left when I was five or so. There is a high chair in the room, I seem to remember it as mine but possibly it was my younger brother’s making me about four. I remember fearing that God didn’t exist. It was terrifying and confusing. In my memory this fear went on a long time. Perhaps it was only moments, or possibly days. What I do remember very clearly is sitting at the table and very suddenly being certain God was there. I remember blurting out to my mother “Mum! God’s really up there you know!” I think she said little more than yes with a rather confused look on her face. I doubt she remembers the moment, it didn’t seem all that momentous from her point of view. To me it was earth shattering. I remember sitting very confidently, a fountain of happiness and peace bursting in my chest and nodding to myself. He’s really up there. I’d like to say I’ve been sure ever since, but I haven’t. Little moments of confusion happen often with deeper periods of doubt punctuating my entire life. I remember a bad bout near the end of high school and another a few years ago. Both of these I worked through by laboriously working through all the reasons I believed to check if I’d made a mistake. I believe because of history, especially the long and even sometimes sordid history of the church itself. I believe because of philosophy. I believe because of theology. I believe because wise men have believed. I believe because I look at true believers and the more fully they live out their faith the happier and more admirable they become. I believe because when I live my faith I am the best version of myself. These intellectual tallying ups would allay my worries for a time. Not only that but they satisfied my vanity. They may not be reasons that convince a nonbeliever but they sound reasonably plausible. I like that. I want to look smart and sensible. So these would be the reasons I would give on that elevator ride. Then I found out my fifth child might die before he was born. I thought: this will be the end. If this child dies, I will no longer be able to believe. This was not a slight worry. I was basically certain. I have fought off doubt this long but this will be the end. I was frozen. I could not think how to pray. I ended up saying those exact words to God. “Lord, I am afraid I will not believe in you anymore if you do not save my baby.” I imagined what I would do when this happened. I decided I would pretend to believe, for my children. That brought me up short. How strange! Why would I do this? The answer made no sense at all: because I believed that when I lost my faith, I would be wrong. I believed that I would think I was right but that I would be wrong and I didn’t want to lead my children into my error. I believed that they would not just be better off believing a lie, but that they would be better off believing the truth while I pursued my lie alone. I did not want to rob them of the greatest treasure I knew of. I realized this wasn’t really the thought pattern of someone who didn’t believe in God. I also realized that it’s a little funny to talk to a person you don’t believe is there and beg him to keep you from forgetting he is real. Although my son did die at 22 weeks, one miracle happened. I became again the little girl at the kitchen table. Suddenly I simply knew. I did not lose my faith. In fact I felt stronger in it than I have ever felt before. I felt otherworldly peace. It hasn’t lasted forever, the old problems have returned, but it was beautiful while it did. God held me in the palm of his hand and I knew it with total certainty. This last incident didn’t “change” why I am Catholic. It just opened my eyes to what had been behind all my striving and searching so far. This is why, in the end, I am Catholic: because of God’s love for me and mine for him. He has always always been with me through every moment of my life. Underneath all those other reasons, the reason FOR all those other reasons is that I have a deep, personal relationship with the God I believe in. I talk to him every day. I cry out to him, I get angry with him, I am grateful to him, I trust him, I am sorry when I hurt him. I love him. He is so intrinsically a part of me and of the world he created that in the end I do not know how not to believe in him. I am Catholic because my God lives and every part of life sings of him. He may not always grant the miracles we want but he performs miracles every moment. The existence of everything is a miracle. Every sacrament is an astonishing miracle, giving supernatural grace for every trial, forgiving sin, knitting together families, bringing God to dwell within us. He telescopes all of time into the very moment that he died for and saved me in the miracle of the eucharist. All for me. And for you. For each of us and all of us. He is my friend, my creator, my father, my savior, and he’s really up there. For many many more personal answers to this question, check out The Anchoress’ post where she is keeping a roll.